A male ruby-throated hummingbird visits a feeder in Danbury, Conn., spring 2018. I saw my first hummingbird of the year about 10 days ago. It paid my feeder a quick visit in the morning and I never saw it again. He must have been on his way northward and stopped for a quick pitstop. But now, the hummingbirds are back for real. A male has been visiting my feeder about every 20 minutes for the last three days. A few times it had to fight off a few rivals to keep its territory. Hummingbirds are small and cute, but fiercely territorial. Here’s a shot a took over weekend. Welcome back. 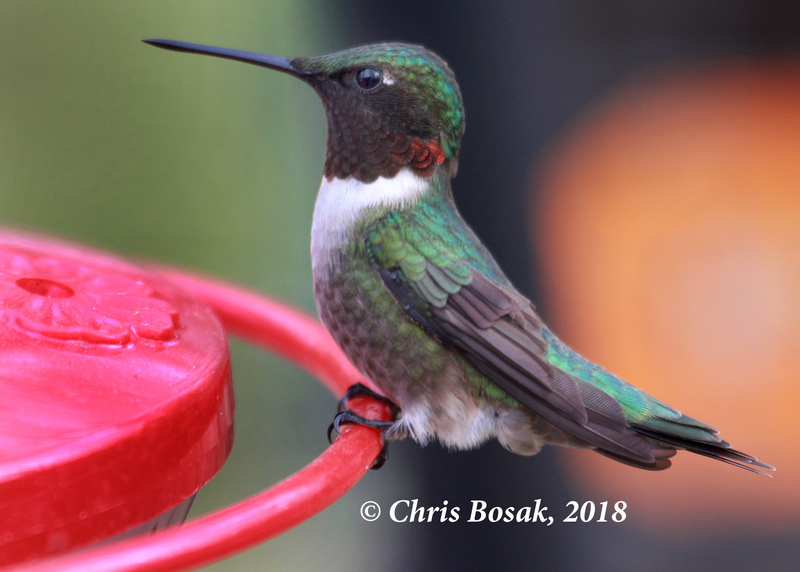 This entry was posted in backyard birding, hummingbirds and tagged Chris Bosak bird photographer, Ruby-throated hummingbird by Chris Bosak. Bookmark the permalink.